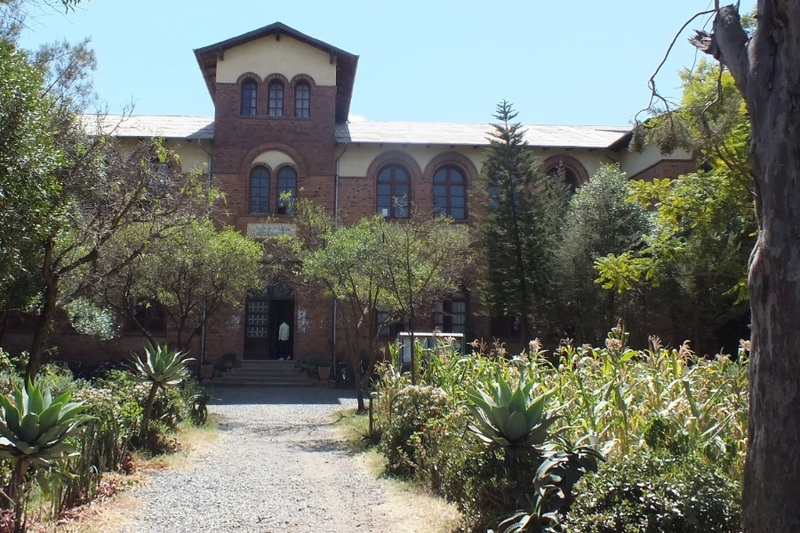 Early in the morning there is an incoming call from Asmara Airport. My last suitcase arrived with tonight's Turkish Airlines flight from Istanbul. I am happy and will collect it right away. Having decided to do everything on foot, I walk al the way from Cinema Roma to Asmara International Airport early in the morning. When walking via Godaif I overestimate my knowledge of the Asmara city plan. When turning to the right in Godaif I have chosen the wrong road and almost walk into the Eritrean Airforce Base. Don't do this as a white-skined tourist with a camera hanging around your neck! So I walk the extra mile to find the correct route passing the Corea Housing Complex and Airport Road. At the entrance of the airport perimeter I am guided to the arrivals gate. I show the property irregularity report, passport and ticket. In the arrivals section of the airport hall my missing suitcase is already waiting for me. I recognise it immediately. Airport officials compare my luggage tags with the label on the suitcase. Before I finally leave the airport compound there is a second check to make sure I leave with my own luggage. It is okay. For 300 Nakfa I find myself a cab to the Cinema Roma area. It is a lot of money for the five or six kilometer ride, but it is no option to carry the 25 kilo's suitcase all the way home. 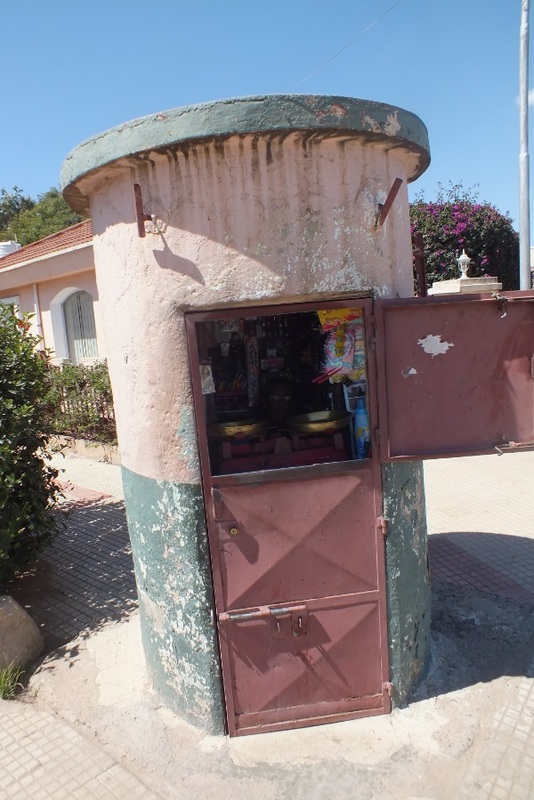 The taxi driver explains the reason for the expensive ride: Eritrea is experiencing a fuel shortage at the moment pushing up prices to around 80 Nakfa per liter ($ 20,19 per gallon calculated with the official exchange rate for the US readers of this travel blog). I promiss myself this will be the last taxi ride during my visit. No rancotous feeling against the taxi owners, but I rather give my Nakfa's for charity and I will bless the workout, the sun, and the opportunities to observe any detail of Asmara, walking to every corner of the city. I check and unpack the content of the second suitcase, hoping some fragile content survived the four days delay and three nights on a Turkish airport. Nothing is missing and nothing broke. I hand the remaining gifts to Luwam, Dawid, and the kids. I am happy my luggage made it after all, and so are the kids with the sweet part of the content. The rest of my stay in Eritrea I can change clothes as much as I like, and that I now have the proper outfit for any occasion. After my lunch in the Gebrehiwet house I visit the IT department of the Housing and Commerce Bank at the Bahti Meskerem Square. We have friends at the IT desk of the bank, and I will bring them one hundred Logica pens as a gift. Both Isak and Kibreab are in. I give the entire bag to Kibreab and tell him to divide the pens among his favorite collegues and/or their kids. It will save me the trouble to hand them out separately and bothering the HCB staff. When I make jokes about the Chifta Woyane (The Eritrean nickname for the Ethiopian enemy), Kibreab tells me they are okay lately. "They are not as agresive as they used to be." I ask Kibreab if I have to stop my Woyane jokes. "Yes, it is better". So from mow on the social talk is not about Woyane, but about families, their health, their kids and about my plans in Eritrea for the next ten days. I always hope the social talk will result in information about events to add to my agenda, but unfortunately both Isak and Kibreab are unable to add any item to my program. 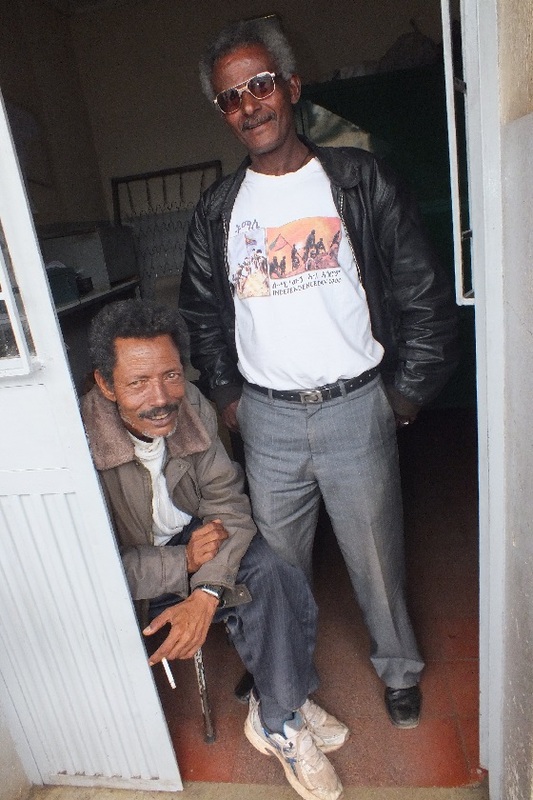 Kibreab invites me to drink coffee with him and Isak in one of the many small cafe's in the center of Asmara. Kibreab asks if I gave pens to Gebremeskel (the general manager of the bank). I tell him I didn't and have to give Gebremeskel managers pens. Kibreab tells me their IT department is the actual managers of the bank. "Without our IT department there is no Housing and Commerce Bank" he jokes. I tell him he cannot convince me. The luxury pens are for Gebremeskel. From the HCB I walk to the Ararat Restaurant that opened a few years ago. The restaurant is located on the Ring Road (turn to the right when leaving Bahti Meskerem Square). I have tea with the owner / manager Yohannes Berhane. He explains that the Ararat Restaurant meets the modern world quality standards. He aims at efficient service for the visitors. Yonas Berhane is one of the many entrepreneurs in Eritrea that predict a bright future. He stated that he expects thar Eritrea will rise from the economic crisis and will be one of the blooming economies in Africa. At 01:00 AM I visit the workshop of the taylor to bring some clothes and last years pictures. I cannot find the familiar faces, but I am sure the address is okay. "They have moved to another place." they explain in a neighboring taylor shop when I show them the pictures of Ali. 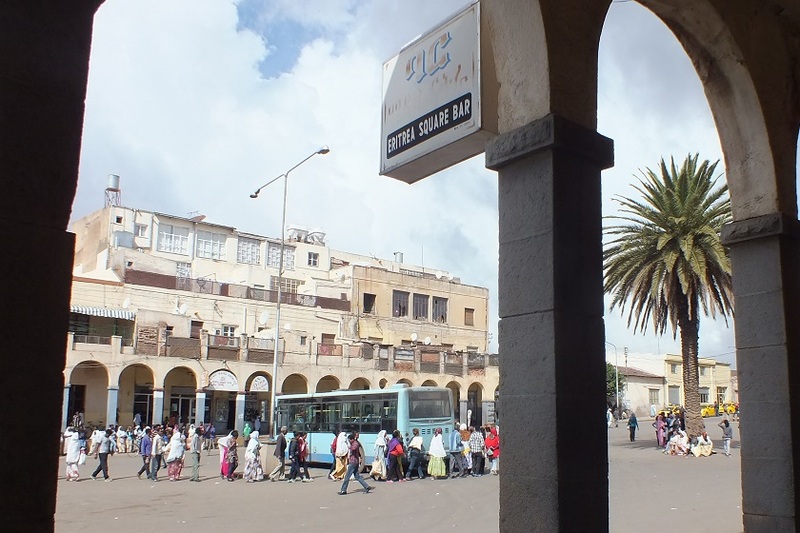 One of the workers of the tailor shop is so kind to guide me to the new location in one of the workshops surrounding Eritrea Square, the main bus terminal of the Asmara public buses. The workshop is still closed because of the lunch break. 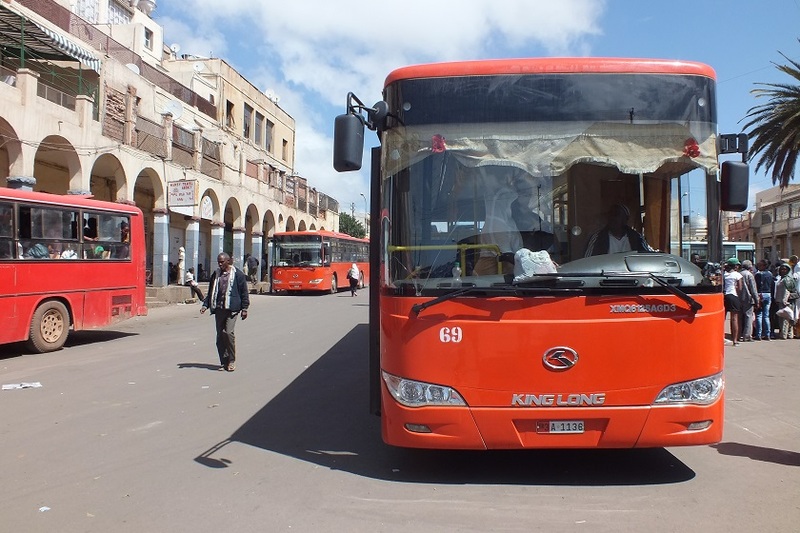 I kill the time strolling up and down the bus station admiring and picturing the new King Long and Karwa Higer buses. Two drivers of the PTZM buses ask if they can be of any help. They think I am lost. I explain my visit and my curiosity for the buses. They want me to picture them as well. They offer me a chair and tea in the small PTZM office to ease the waiting time. I watch the buses coming in. The passengers are lining up in a perfect queue and enter the buses without pushing. It is quite different from the behavior I experienced during my previous visits to Eritrea. Ali is surprised I traced him to his new workshop. He insists I drink tea with him. We discuss my oversized trousers and the hole in the inner pocket of my Adidas training jacket as well as my wife's wishes for a few new dresses. (She gave me one as an example to define the size) My repairs are free of charge. "It's nothing" he sais "You can collect them tomorrow in the morning." At 3:00 AM I am surprised by heavy rain showers. One would not expect to run for some shelter in a climate like this. But it will be a blessing for Eritrea's agriculture. Dressed in a thin shirt only, I take shelter in Berhane's Farm Shop, where Aster and her two collegues sell medicine and vitamins for the livestock around Asmara. Aster offers me a chair. I watch the farmers visiting the shop, ordering products or asking for advise. Aster invites me to come back to have lunch at her house. 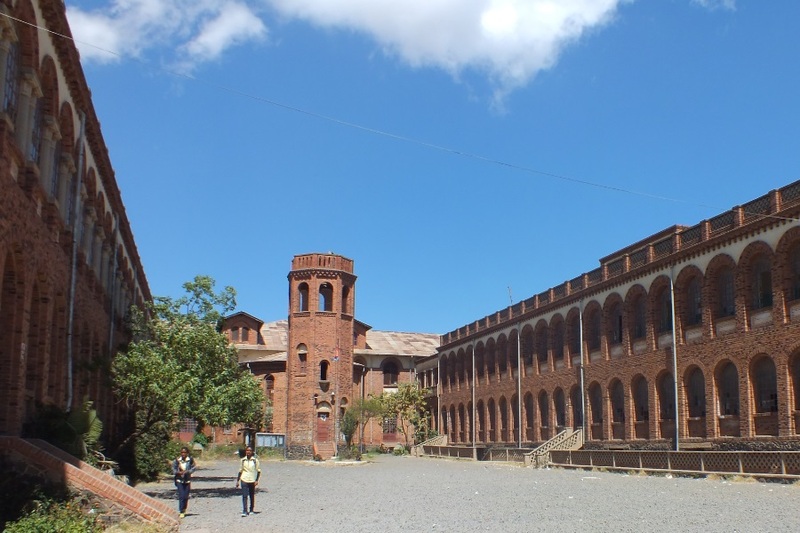 When I pass the beautiful Semaetat Secondary School I think I will regret it if I do not make some pictures of the fine example of historic architecture. To prevent any problems I ask one of the teachers if it is okay to make some photo's. He guides my to the director of the school. I explain my situation. 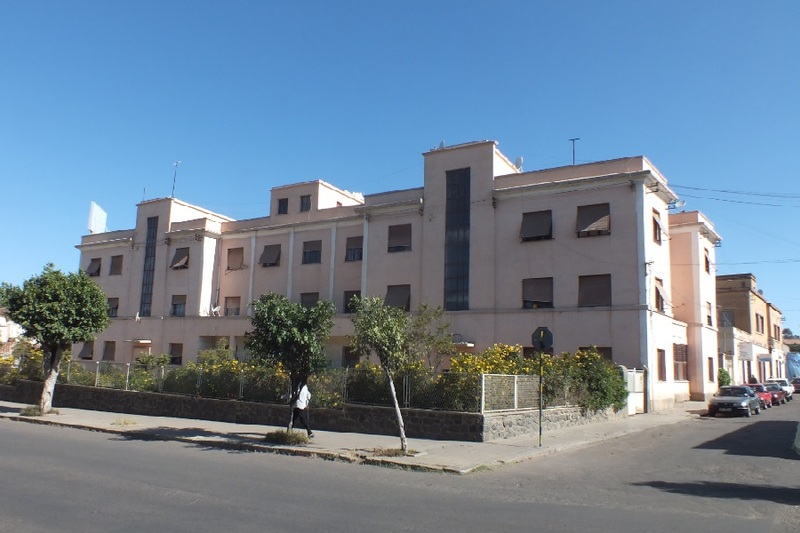 After the this short conversation I am welcomed to picture his school and enter the front and back compounds that surround the school The school is very close to the US embassy in Asmara, where making pictures is not allowed for security reasons. I am still wondering why the Americans are frightened for camera's and Eritrean women and kids have the courage to pose for my camera. I guess it is US bad conscience. 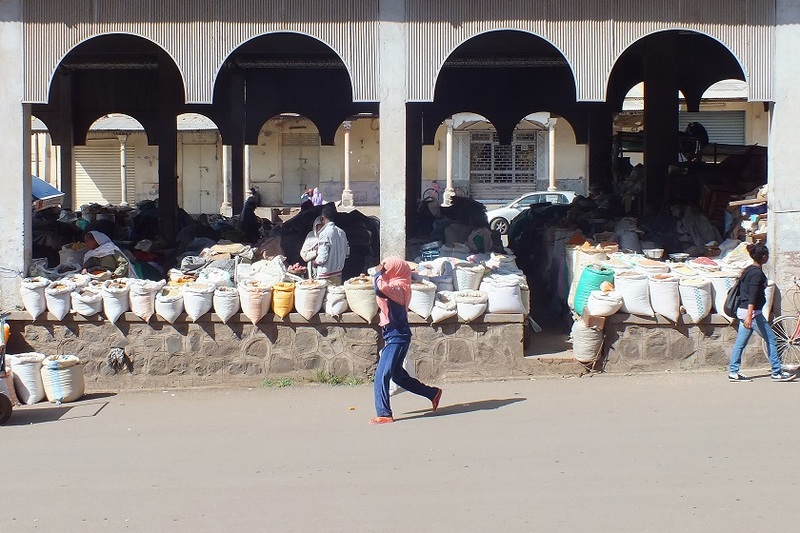 Grain and spices market - Souk Asmara Eritrea. 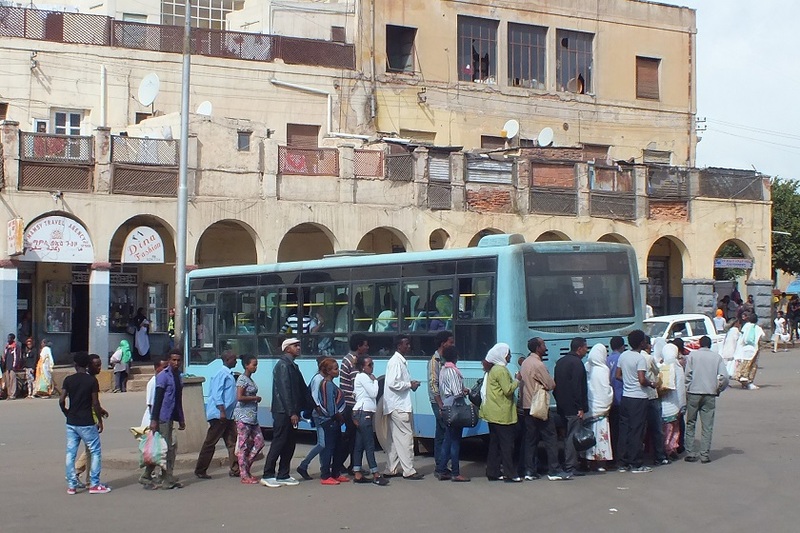 Boarding the public bus - Eritrea Square Asmara Eritrea. 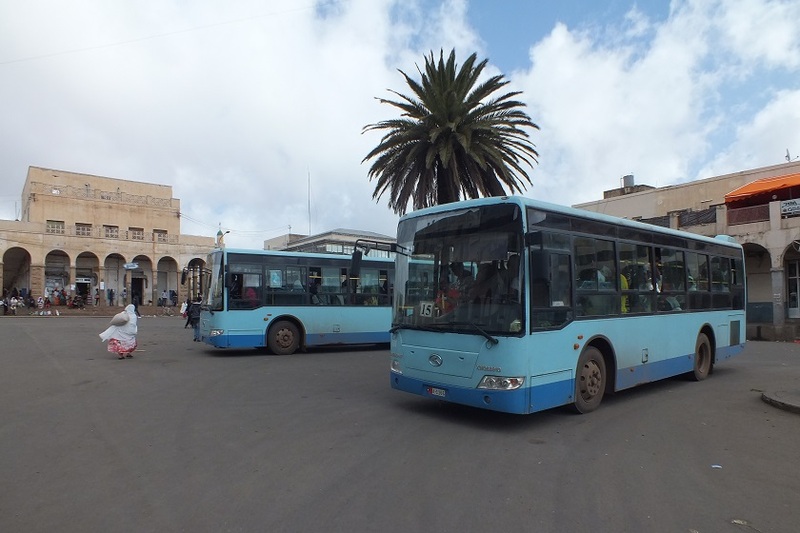 PTZM Bus drivers - Eritrea Square Asmara Eritrea. 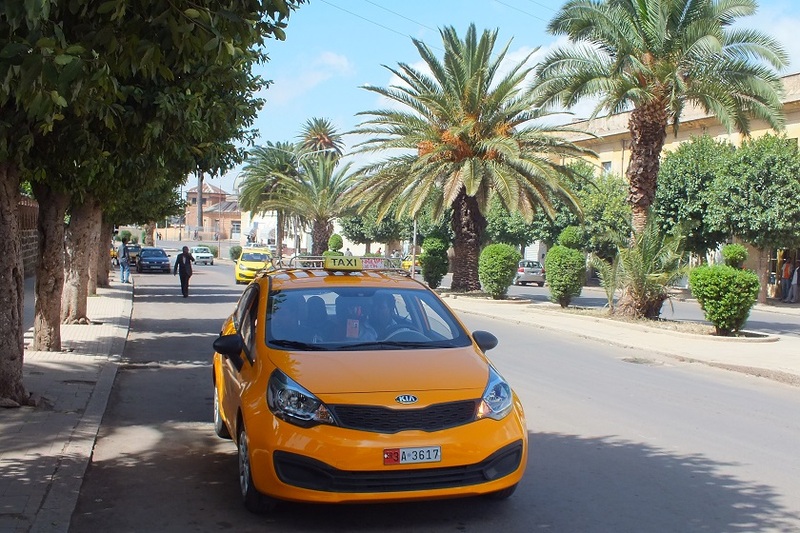 Kia taxi - 176-17 Street Asmara Eritrea. 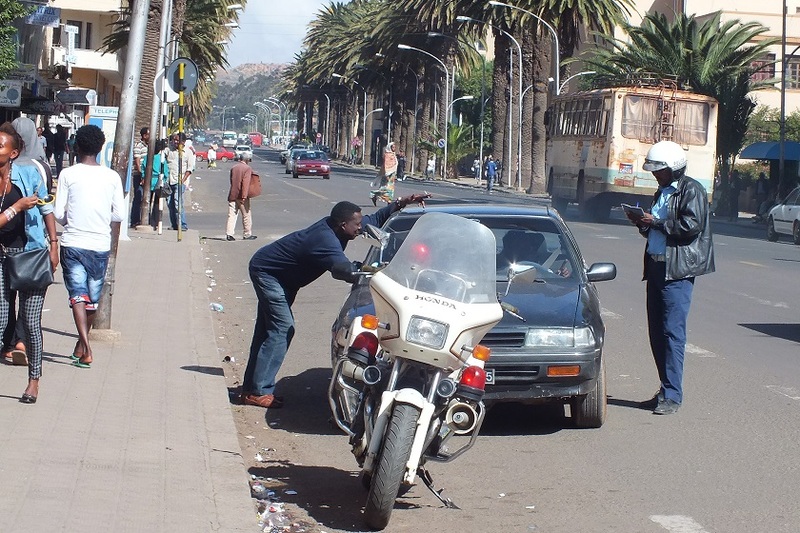 Asmara police - Harnet Avenue Asmara Eritrea. 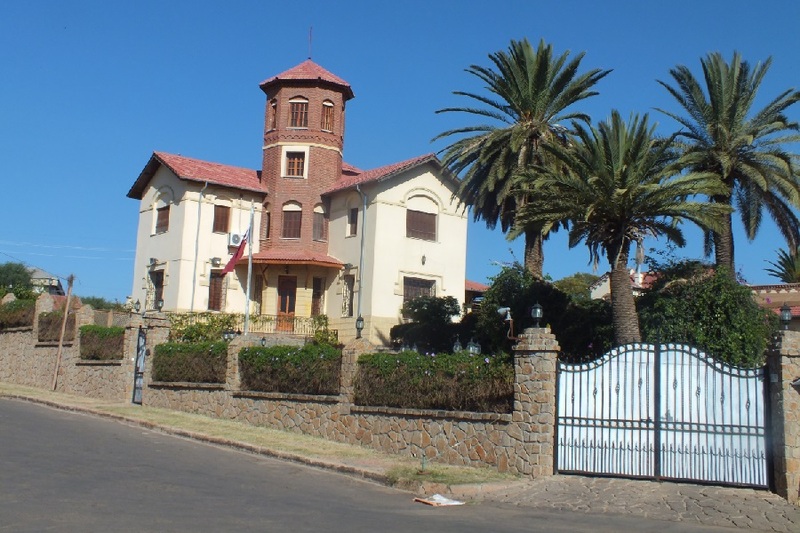 Qatar embassy - Central Zone Asmara Eritrea. 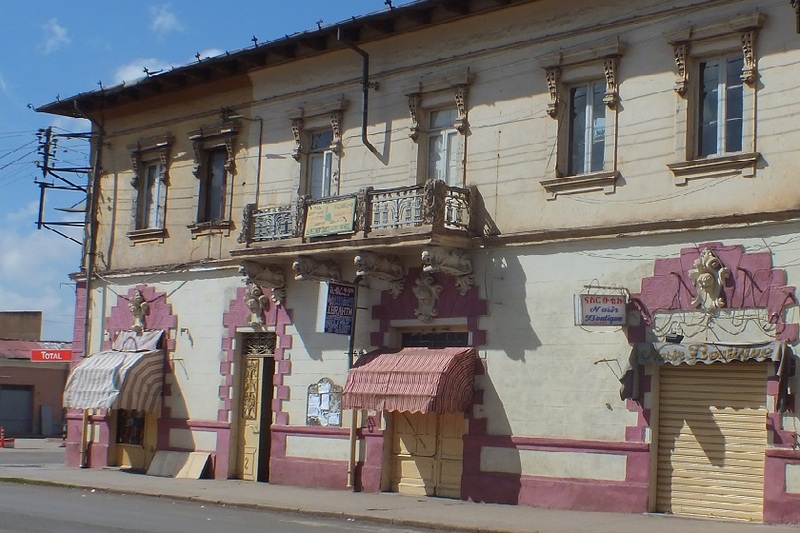 Apartments - BDHO Avenue Asmara Eritrea. 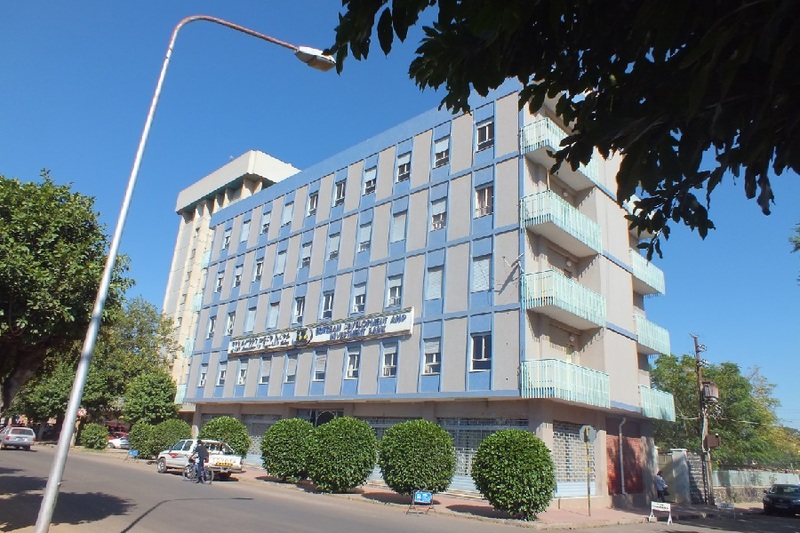 Eritrean Development and Investment Bank - BDHO Avenue Asmara Eritrea. 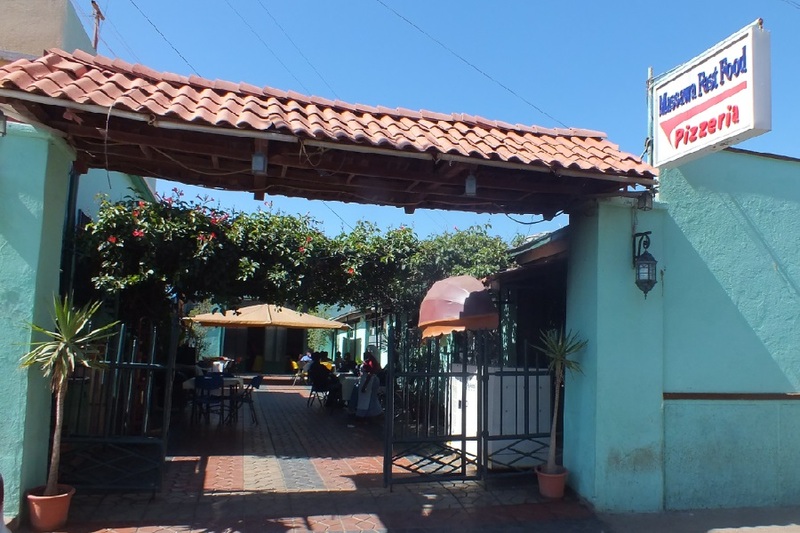 Massawa Fast Food (near Savanah Hotel) - Asmara Eritrea. 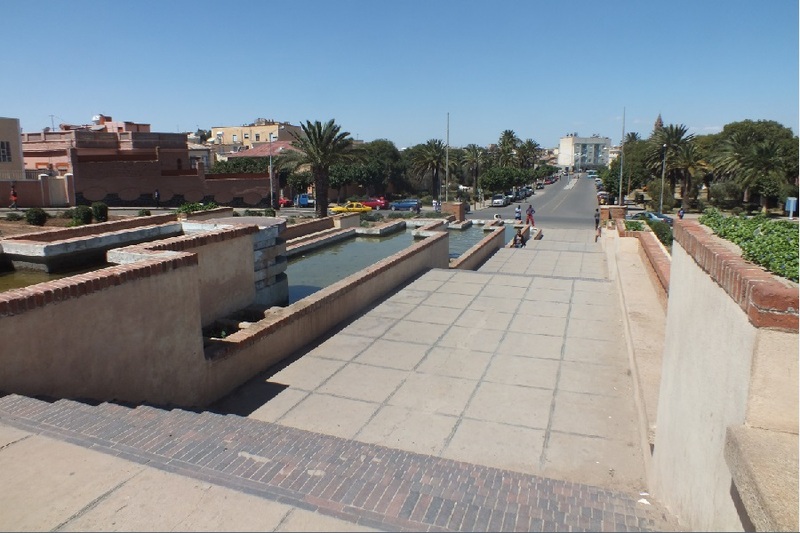 Mai Jah Jah Fountain - Marsa Teklay Street Asmara Eritrea. Mini mini market - Gheza Banda Asmara Eritrea. 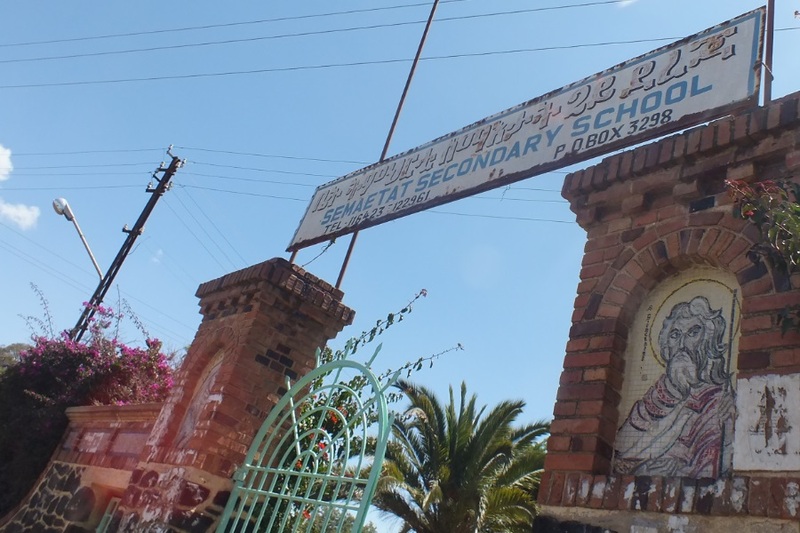 Semaetat Secondary School - Gurieto Street Asmara Eritrea. 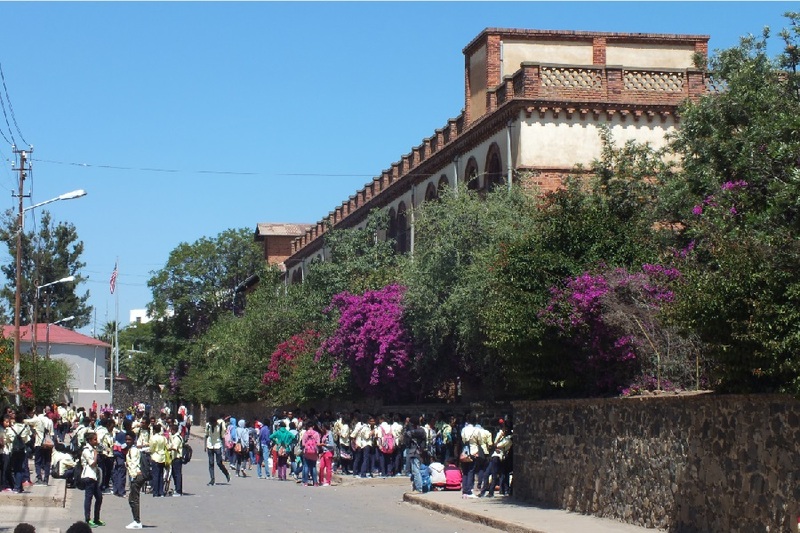 Semaetat Secondary School - Bada Street Asmara Eritrea. 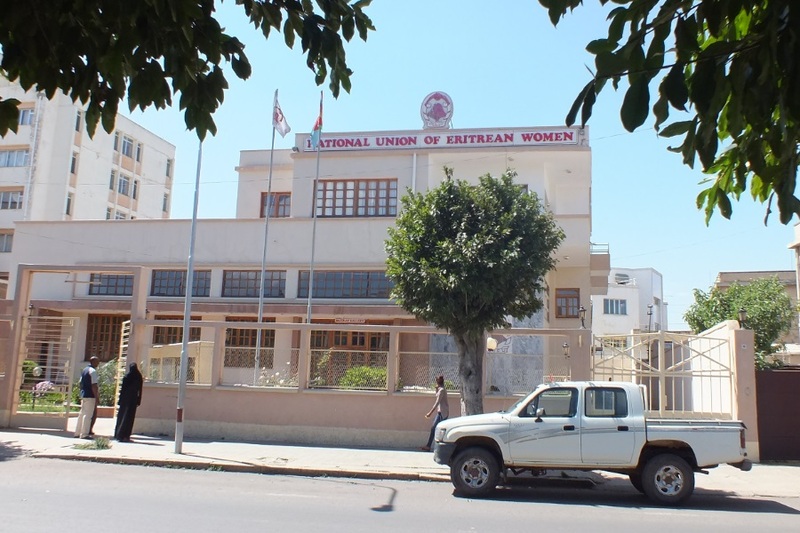 National Union of Eritrean Women (NUEW) - BDHO Street Asmara Eritrea.